Peter G. H. Evans Ph.D. When Christopher Columbus arrived in the Caribbean, heralding the first wave of European immigrants, many of the islands of the Antilles had their own parrot populations. Macaws probably existed on Guadeloupe, Martinique and Dominica as well as on Cuba and St Croix in the Virgin Islands. Our knowledge of their existence relies upon historical accounts and, in the case of the St Croix Macaw, sub-fossil bones. Parakeets also once occurred on Hispaniola and Mona Island, and on the Isle of Pines off Cuba. Now all those populations are extinct. Following them to extinction have been parrots thought to be of the genus Amazona, on the islands of Guadeloupe and Martinique, and it may be that other Antillean islands were also once the home of Amazon parrots. The modem traveller to the Caribbean will find virtually all the endemic Amazons endangered, with populations often only a remnant of their former size. What has caused this present sad state of affairs? Two factors above all others have resulted in Amazon parrots becoming endangered in the region. These are habitat destruction and hunting. Often it is difficult to distinguish which has played the most important role since they commonly occur alongside one another. As islands were colonized by waves of immigrants, those peoples would have cleared areas of forest to establish settlements and particularly to grow crops such as dasheen and tannia. For their meat, they will have hunted parrots, amongst other animals of the rainforest. Although the Arawak and Carib Indians had probably already exerted some effect particularly upon the more vulnerable macaws, using bow and arrow, the European colonists brought with them more efficient musketry. Parrots require extensive areas of intact forest to survive so that as it became divided up into smaller and smaller fragments, the pressures upon them to find sufficient food and nest sites will have accelerated. On top of those pressures, the forests have experienced regular damage from hurricanes. They occur at a frequency of about one every fifteen years, although intensities vary and one may occur per century that has devastating effects. If parrot populations have already been depressed by the activities of humans, such habitat destruction from a hurricane may be the final nail in the coffin. Recent years have witnessed just such damage with hurricanes David and Allen hitting the islands of Dominica and St Lucia in 1979 and 1980; hurricane Gilbert hitting Jamaica in 1988; and hurricane Hugo the islands of Guadeloupe, Montserrat, St Kitts/ Nevis and Puerto Rico in 1989. It remains to be seen whether the more critically endangered populations of Amazons such as the Imperial Parrot on Dominica and the Puerto Rican Parrot are able to withstand these extra pressures. Nine species of Amazons are confined to islands in the Caribbean, with two species on Jamaica and Dominica, and one each on Cuba, Hispaniola, Puerto Rico, St Lucia and St Vincent. Those on the larger islands of Jamaica, Cuba and Hispaniola are not thought to be endangered although after hurricane Gilbert this may no longer be the case for the two species on Jamaica, and there is little recent information from Cuba. Populations on the other Antillean islands are certainly in a precarious situation. On Puerto Rico, the wild parrot population had declined to 13 individuals by 1975. An intensive management programme started, centred upon the Luquillo Forest in the eastern mountains, where the remnant population occurred, with captive rearing of young fostered by the closely related Hispaniolan Amazon. With such attention, both captive and wild population increased, so that by the end of the summer of 1989, there were 53 individuals in captivity and 47 in the wild. Then hurricane Hugo struck the island and, at the time of writing, only nineteen wild individuals had been found alive. Next most endangered must be the Imperial Parrot of Dominica which suffered the ravages of Hurricane David in 1979, the population declining from 150-200 in 1972 to a present total of somewhere between fifty and one hundred individuals. These are restricted to the northern mountain massif, dominated by the highest peak Morne Diablotin. On the same island, the Red-necked Parrot population also suffered, but habitat destruction and hunting appeared to have had less effect upon the species, and at the time of the hurricane its population was maybe three times as great as the previous species. 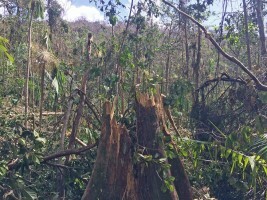 Already it is showing signs of recovery and the population presently numbers 250-300 individuals, also centred upon Morne Diablotin, although birds are returning to the central mountains of Dominica. A large part of the northern forests come within a reserve, but there are still unprotected areas of importance to both species. One such area along the edge of the Picard river valley was saved from logging in summer 1989 and will form a parrot reserve, with facilities for conservation education and research, and nature tourism. Whereas Dominica still retains large tracts of forest, on St Lucia and St Vincent, much of the forest had been cleared for agriculture by the middle of this century, and hunting was the major pressure. Numbers of St Lucia parrots were estimated to be down to one hundred individuals in 1977, and the situation was made worse by the effects of hurricane Allen in 1980. However, an energetic conservation education program mounted by the local Forestry Division with the help of Paul Butler, has gone a long way to conserving the species, the remnant forests being protected and hunting much reduced. Now the population numbers somewhere around 200-250 individuals, though still confined to the forests of the central mountains. The distinctive Amazon on St Vincent is confined mainly to the central mountain forests in the Buccament, Cumberland and Wallilibou valleys. In 1976, the population was estimated to number 500-550 individuals. Then a volcanic eruption in 1979, and hurricane Allen in 1980, destroyed important nest sites and food plants. The population apparently declined to 400-500 birds, but there been recent signs of recovery, the latest estimate around five hundred individuals. A conservation education programme similar to the one on St Lucia has been started, and steps have been taken to reduce illegal trade of captive birds. Most Caribbean Amazons are of broadly similar appearance - mainly green with patches of red around the face or throat and yellow on or around the tail. The St Lucia, Red-necked and Imperial Parrots have red in the wings, whereas the Puerto Rican, Black-billed, Yellow billed, Hispaniolan and Cuban Parrots all have greater or lesser amounts of blue in the primaries. The St Vincent Amazon is quite distinct with a mainly white or yellow head and patches of violet on the sides and back of the head. The wings are mainly golden brown but edged with green, a yellow speculum and purplish primaries. The back varies from golden brown to green. The tail is green and violet blue with a broad yellow band across the tip. 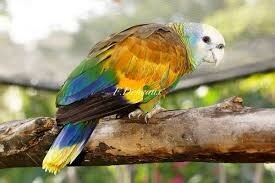 Another distinctive Amazon is the Imperial Parrot of Dominica. It is the largest member of the genus and has a bluish-purple head, neck, underparts and tail. Its back and wings are dark green in colour. In flight all the Amazons are readily identified as parrots by their shallow regular wing beat, sometimes interspersed with short glides on down curved wings, and by their cries ranging from a harsh screech or squawk to a trumpeting sound. Amazons are most active early in the morning between dawn and 10 am, and in the late afternoon from 4 pm until dusk. Those are the times when they are engaged in most long-distance flights, either moving to potential feeding areas or returning to often communal roosts. Calling is greatest at these times, presumably as birds seek to keep in contact with one another. Many species forage in twos or threes (perhaps a pair and single young) although these often aggregate into loose flocks during long distance movements and at feeding or roosting sites. It is probable that such sites are traditional, and used over a long period of time. This poses additional conservation problems, making it more difficult for birds to recolonize or be reintroduced in areas inhabited in former times. It also means that the continued presence of birds in a region that is fast being modified by humans for agriculture does not necessarily mean that those areas are satisfactory for the long term survival of the species. Few of the Caribbean Amazons have been studied in any detail but where they have, they show broadly similar patterns of ecology and behaviour. The fact that the species are probably all long-lived and they often associate in pairs throughout the year suggest that they form long term pair bonds. Additional immature birds in groups of three are generally assumed to be their young, and they can remain in loose association for several months. Captive studies (mainly of the Puerto Rican Parrot) indicate that birds attain sexual maturity around 4-5 years, a few as young as 1-2 years and some as late as fourteen years. Nesting usually occurs between February and June, coinciding with the dry season. This may be related to timing of peak availability for the growing young although there are few data to support this. The nest site is in a hollow branch or trunk, or behind the peeling bark of a tree. It is often at a height of 15-25 metres and may be further protected by vines or creepers. Nest predation is not uncommon, particularly by pearly-eyed thrashers which will destroy eggs and young and may then take over the site themselves. In Puerto Rico it has been such a problem that special nest boxes designed for each species have been erected side by side. This encourages the thrashers to use the adjacent site more suited to them, and during territory defence they keep other thrashers from taking over the neighbouring parrot nest site. Between two and four (usually three) white eggs are laid deep in the tree cavity and these tend to be incubated primarily by the female, hatching out around 31/2 weeks later. The male regularly brings food to its mate over this period. The nestlings are fed by both parents and fledge around 4-5 weeks later. Usually only one or two fledge successfully. Parrots are primarily seed predators, taking fruits of a variety of species and peeling off the pericarp so as to get at the seed inside which is usually cracked with the powerful beak. During the feeding process, the fruit is often held in its foot. Feeding bouts are generally quiet affairs, individuals making only soft whistles or short screeches during interactions with partners. 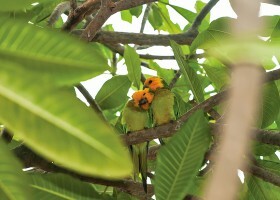 The fruits of many of the dominant rain forest tree species are important in the diet of most of the Caribbean parrots. One such tree that is fed upon by a variety of parrot species is Daerodes excelsa. In Dominica it certainly plays an important role in the diet of both Red-necked and Imperial Parrots, and the same species is taken on other Antillean islands. However, all the Amazons have fairly catholic diets and at certain times of the year they feed upon leaf buds and blossoms, whilst palm seeds are often favoured. Those species which commonly come into contact with man, may also cause damage to cultivated tree crops such as papaya, pimento, guava, mango and even banana and plantains. The future for the Caribbean Amazons must remain bleak. Despite recent efforts in the Eastern Caribbean to protect the species there, those on the Greater Antillean islands of Cuba and Hispaniola receive little protection, and the major threat of forest clearance continues on all the islands. Several countries have an Amazon parrot as their national emblem and the local people are becoming increasingly aware of this important heritage, helped particularly by conservation education programs. However, the same people and their governments rarely realize that by their own activities in turning more and more forest into plantation, those species are increasingly threatened. It may only take one crippling hurricane to finish off some of the rarer species. For the long term security of the Caribbean Amazons, they must be recognized for themselves as an important economic resource, one that will bring naturalists and other visitors to the country to seek them out and marvel at their beauty in a backcloth of rich prime rain forest.